Posted in: 1 Pageant Pages, 2 Shout-out-Looks. Tagged: 63rd Miss Universe, New York Fashion Week, Nia Sanchez, Paulina Vega. Miss Universe Paulina Vega, together with Miss USA 2014 Nia Sanchez and Miss Teen USA 2014 K Lee Graham took time out from their busy schedule to attend shows at the Mercedes-Benz New York Fashion Week Fall 2015. And it was obvious that all three ladies had a good time in the event. Posted in: 1 Pageant Pages, 2 Shout-out-Looks. 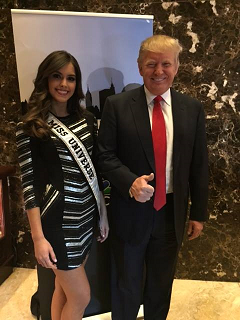 Tagged: 63rd Miss Universe, Donald Trump, Paulina Vega. It’s the best beauty queen job of all, and Paulina Vega is living the good life to the fullest. Aside from a well-appointed Trump apartment in Manhattan, she gets to make celebrity appearances in the US as well as travel to different countries (like Djakarta where she helped crown the national winner) in style and with VIP treatment to boot. Watch the video below which followed Paulina during her first week as Miss Universe, and tell me if it’s indded one of the most enviable jobs every year. Posted in: 1 Pageant Pages, 2 Shout-out-Looks. Tagged: 63rd Miss Universe, Fadil Berisha, Paulina Vega. Below is the video of the first Miss Universe photoshoot of Paulina Vega. And who else to take charge of the same but Fadil Berisha. Sunday Specials: Destination-China for Miss Universe 2015??? Posted in: 1 Pageant Pages, 2 Shout-out-Looks. Tagged: China, El Nuevo Dia, Miss Universe 2015, Paulina Vega. Will Paulina Vega really crown the next Miss Universe in China? Miss Universe Paulina Vega was quoted saying the line above to El Nuevo Dia. Click to read more. In Spanish, that is. A news article that was published by El Nuevo Dia had quoted Miss Universe Paulina Vega saying that Donald Trump told her the next edition will be held in China, and that she will be thrilled by crowning her successor there. Do we now take this bit of news as fact, rumor or an unconfirmed slip of the tongue? You see, the Miss Universe Organization (MUO) always makes it a point to release an official statement, however belated the important update is. So for now, let’s take this information as a strong possibility. 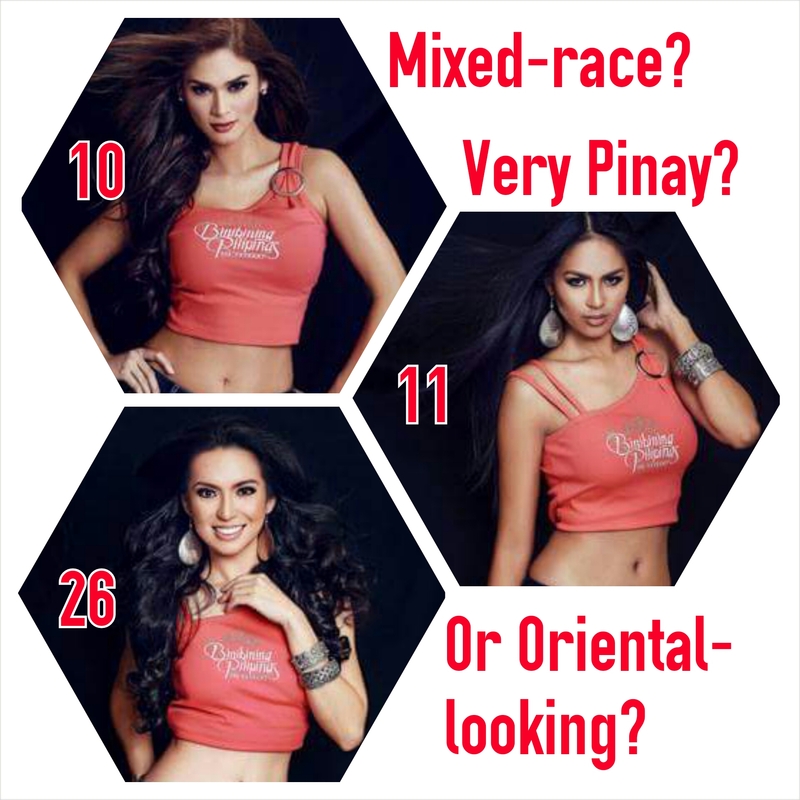 Which type would be the best-looking rep if China will host Miss Universe 2015? Paulina and Rolene: Can they follow the glorious reigns of Gabriela and Megan? Posted in: 1 Pageant Pages, 2 Shout-out-Looks. Tagged: Gabriela Isler, Megan Young, Miss Universe, Miss World, Paulina Vega, Rolene Strauss. To say that Gabriela and Megan are tough acts to follow would be an understatement. The 63rd Miss Universe Paulina Vega Dieppa of Colombia and Miss World 2014 Rolene Strauss of South Africa have the demanding work cut out for them. With their respective predecessors serving reigns that were considered more than successful in terms of appearances, international causes/charity and positive sustenance of the crown and brand name for more than 365 days, the challenge now is to exceed the efforts and make both Donald Trump and Julia Morley happier bosses. That won’t be too much of a difficult mission to accomplish, right? Call me quick to judge at this point. But methinks Rolene will meet the expectations more handily than Paulina. It is a proven fact that the South African has one of the most wonderful down-to-earth personalities during the competition in London last year. On the other hand, the Colombian has been rumored to have a recurring diva attitude that even Mr. Trump allegedly anticipates to border on being an all-around b**ch. Posted in: 1 Pageant Pages, 2 Shout-out-Looks. 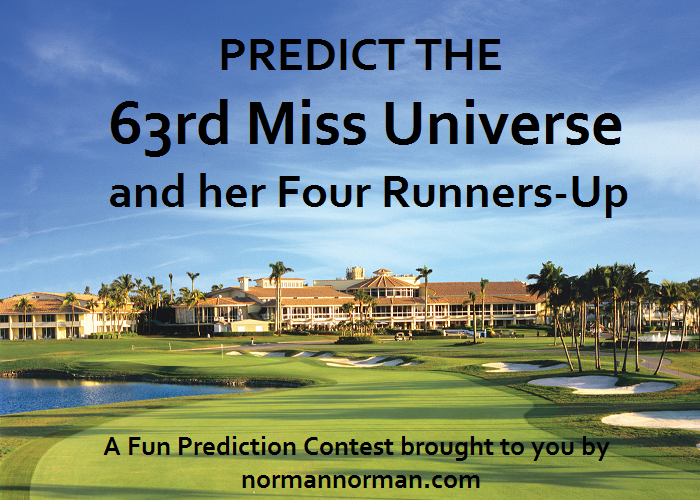 Tagged: 63rd Miss Universe Pageant, Nia Sanchez, Paulina Vega, prediction contest. Venus is the closest after she correctly predicted Colombia and USA as 1 and 2, respectively. First off, l only considered the predictions sent by email to norman.blogsite@gmail.com and with corresponding address and contact details. 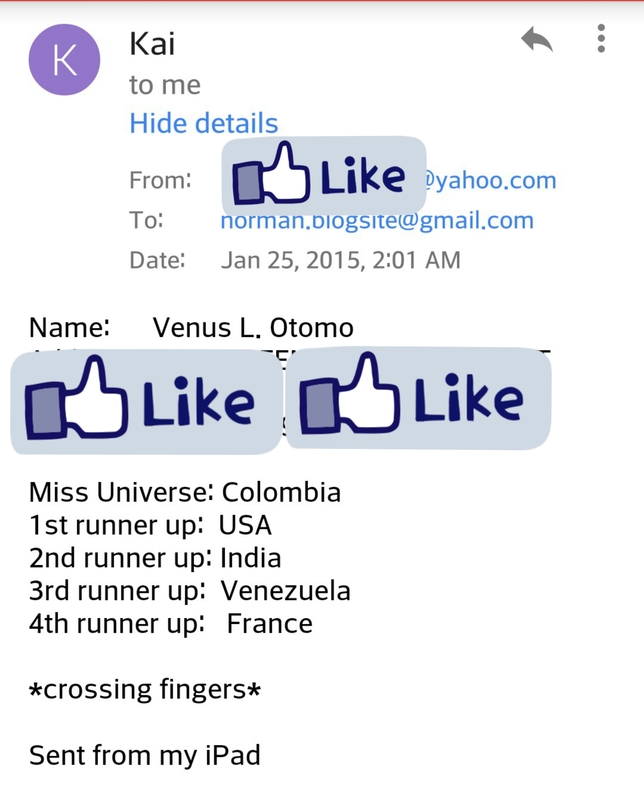 So for those who posted theirs as a reply in one of the blog announcements about “Predict the 63rd Miss Universe Pageant and her 4 Runners-up”, I did not include your guesses anymore. Sorry. Among the four hundred eighteen (418) emailed entries, nobody got all the five correct placements right. When I was checking all the predictions, I separated all the ones with Miss Colombia Paulina Vega as winner. And there were only eleven (11). From this small bunch, the runners-up were all misses in rankings. But one actually had Miss USA Nia Sanchez as her 1st Runner-up. And so, the winner of our prediction contest is Venus L. Otomo from Cavite. She is now the proud owner of a brand new Zenfone 5 and P1,500 shopping voucher from Bench (I had to switch from SM Store due to a small glitch). I already emailed Venus about the win and hopefully, she can drop by the office in Makati to pick up the prizes.